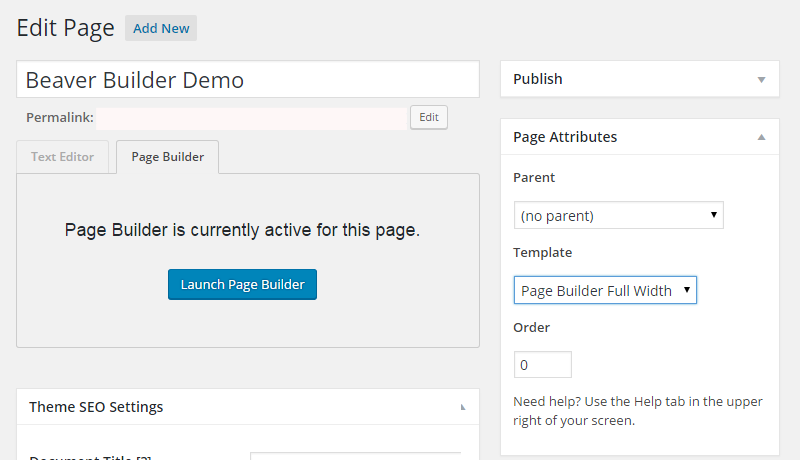 For starters, Beaver Builder is a page builder plugin for WordPress. To get full width layout automatically when using Beaver Builder plugin, you can use “page builder” templates included in the separate theme version for page builder users. Note: “Sunshine Pro” theme has a separate version “Sunshine Pro BB” that include these page builder templates and associated code. If you intend to use Beaver Builder, make sure you are using “Pro BB” version of the theme. 1. In WordPress Dashboard, go to Pages > Add New option. 2. Enter a page title and select Page Builder Full Width from “templates” dropdown under “Page Attributes” section at middle right. 3. Start building your page using page builder, it will render full width in content area automatically. For full width blank layout (no header and footer areas), use “Page Builder Blank” template. Note: If you want to use a Beaver Builder created page as homepage, then rename or delete “front-page.php” file. For example, you can rename it to “old-front-page.php“. Renaming will prevent this file from over-riding homepage settings and allow BB page to display correctly.